Before being made bishop of Milan in 374, St. Ambrose had been serving in a civic post in northern Italy, having been trained in law. He is best remembered for three achievements that have sustained the life of the Church for centuries: his dynamic preaching against the Arian heresy, his role in the conversion and baptism of St. Augustine of Hippo (354-340), and his belief in the importance of hymn-singing the the life of the Church. He has often been honored as the “father of hymnody,” and for good reason. A psalm joins those with differences, unites those at odds and reconciles those who have been offended, for who will not concede to him with whom one sings to God in one voice? It is after all a great bond of unity for the full number of people to join in one chorus. The strings of the cithara differ, but create one harmony [symphonia]. First, he had various psalms sung antiphonally by dividing the singers into two groups which alternated in the singing. This ancient method of singing, a practice observed among the Jews, is said to have been introduced to Christianity by Ignatius of Antioch. From Antioch it spread to other churches in the Eastern Roman Empire. Ambrose may have witnessed the practice, or at become aware of it, when he was working [in judicial capacity] in Sirmiujm [before his baptism and ordination]. Second, Ambrose introduced the singing of metrical hymns [i.e., hymns, rather than psalms, based on texts that included a formal rhythmic pattern based on a certain number of syllables in each line], another practice observed in the Eastern churches but previously unknown in the West. 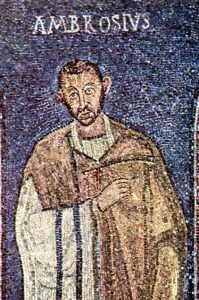 In fairness it should be mentioned that Hilary of Poitiers [310-368] had previously attempted to introduce hymn singing, and he might be credited with being the first Latin hymnwriter. However, Hilary was unsuccessful in teaching people to sing hymns, and the surviving fragments of Hilary’s hymns suggest that they were poorly composed and not appropriate for congregational singing. in The Hymn (October 1997).